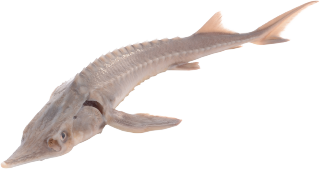 A sturgeon needs special sturgeon food, because its mouth is at the underside. Sinking feed is concerned here, which has a very strong odour, to the effect that it resembles its natural feed. There is special sinking feed for all kinds of sturgeons, with a high energetic value geared to the metabolism of a pond sturgeon. Its main components consist of fish products, vegetable proteins, fats and carbon hydrates. Besides sturgeon feed contains added trace elements and vitamins. The best thing you can do is to feed a number of times a day. Take care that the sturgeon feed distributed will be eaten within 5 minutes. Feed that is not eaten may form additional waste in your pond and a burden for the biological equilibrium. Properly clean the bottom of your pond. Accumulating dirt and feed may cause gasification, as a result of which sturgeons may fall ill and might die. This is explained by the fact that bacteria are consuming all the oxygen in the water layer where sturgeons stay most. A proper bottom drain is therefore necessary. Do you want a sturgeon in one single pond? You should bear in mind that a koi will find sturgeon feed quicker than the sturgeon itself. Especially small sturgeons will sometimes starve to death. It will help then to feed fish every day at the same time and place. In this way you teach fish where their feed is. Distract koi on the other side of the pond will allow a sturgeon some more time. Sturgeons up to 20 centimetres should be fed every 3 hours, if not, they will die.